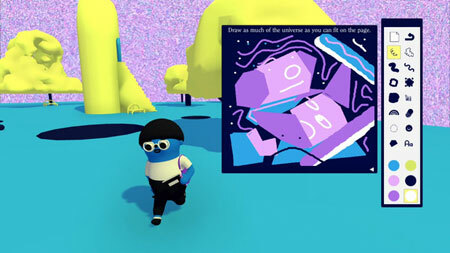 Art Sqool is an awesome simulator by Julian Glander. Explore the sprawling Art Sqool campus in 3D. Find and collect cool brushes to help you in your artistic process like the wiggle brush, rainbow pencil and mop. Use your drawing pad to complete your assignments and progress through the game. An A.I. art professor grades your work and hands out assignments. Over 200 inspiring prompts to help you break through any creative block. If you get stuck in the game, check out the video walkthrough and gameplay for the game. This entry was posted in PC and tagged Art Sqool Cheats, Art Sqool Gameplay, Art Sqool Guide, Art Sqool Strategy, Art Sqool Walkthrough by Marvin Tang. Bookmark the permalink.